Condition: Excellent - bright clean, all original, containing all 15 original movable figures with none missing. Conservators notes: All figures are in fine condition. # 12 is original except for a small piece on it - the head of the small turkey is a restoration - see photo. Back of envelope flap mended with Japanese tissue paper to close a tear. Pages invisibly reinforced at folds with archival filmoplast. 30cm x 27cm 11" X 12.5"
On the reverse of slot plates is a story. Rear panel is designed as a pocket to hold the figures when not in use. *Between 1900 and 1910 Date of publication understood from publisher's imprint, cf. Blair & Margaret Whitton's Collector's guide to Raphael Tuck & Son, p. . "Publishers to Their Majesties the King and Queen"
things of the last generation ; they come in a greater variety of subjects and are profusely colored. 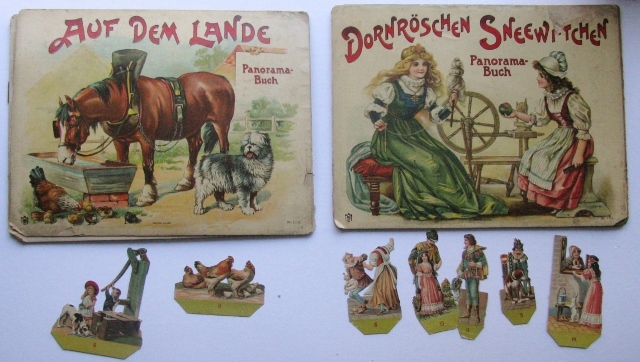 The figures in each book- let make a part of a series of tableaux illustrating fairy stories, etc. Many Of the booklets contain birds and Wild and exotic animals. They are well drawn and colored perfectly, showing a regard for accuracy that ought to make some Of the "nature fakirs" feel envious." Following the image below is a list of other Tuck panoramas with separate figures to insert into slots. Dating each edition depends on publishers info on back. Some of the early ones were reprinted in the 1920's and or 90's. We are very appreciative of the website TuckDB Ephemera when it comes to researching Raphael Tuck. The image below came from their website and was taken from Raphael Tucks 1928 "WORLD'S ART SERVICE" catalog. Following is a list of other Tuck panoramas with separate figures to insert into slots.